New Book! 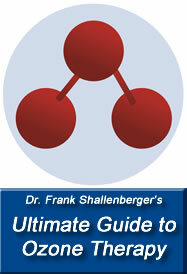 : Dr. Frank Shallenberger's new book is your ultimate guide to Ozone Therapy. Click here to see more information about his book, "The Ozone Miracle". It includes full instructions on how to perform Ozone Therapy, written by North America's leading Ozone Therapy teacher, Dr. Shallenberger. 1. BUYING AN OZONE GENERATOR: International Experts Speak Out: Quartz Glass Electrodes are best for ozone generators. 2. Quartz Glass or Ceramic? Find out which material is best for Ozone Electrodes (Hint: One of them does not even exist). Do you know what is inside your ozone generator? Some materials are not suitable for the interior of an ozone generator. Click here for this crucial information. Welcome to Oxygen Healing Therapies. Com., the leading website since 1999 for Ozone Therapy Training Courses and Information. Here you will find information pertaining to Ozone for Water Purification, Medical Ozone Therapy, UVB Therapy, (also called UVBI), Sauna Therapy, Ozone Saunas, Ozone Generators, Buyer's Guides, Ozone Clinics, Ozone Doctors, Certified Ozone Courses, Ozone Books, Ozone Conferences, and New Information about Oxygen Therapies. Professionals and Home Users alike will find this site to be an invaluable source of information for everything regarding Ozone and Oxygen. We have the most comprehensive and up to date "Ozone Doctor" listing, which provides contact details for Ozone Doctors from around the world. We also provide Ozone Generator Buyer's Guides and information and directions for properly Ozonating Water, Olive Oil, Saline, and more. The Ozone Courses we post on Oxygen Healing Therapies.com are taught by the leading world experts on Ozone Therapy. We ensure that each course that is listed is led by well educated, experienced practitioners who provide accurate, scientifically verified information regarding the use of Ozone for the many applications and protocols for which it is suited. If you are a practitioner in search of accurate, well referenced information regarding Ozone Therapy we invite you to attend at least one of these courses to educate yourself regarding the safe and effective use of ozone. For those practitioners who believe that Ozone Therapy does not work, or that Ozone is Toxic, we challenge you to attend one of these courses and maintain your beliefs. Why would we issue you this challenge?. Because once you have viewed the clincal evidence, the solid research that spans greater than 80 years, and the detailed biochemical and immunological explanations regarding Ozone's effect on the human body we guarantee you will be at a crossroad. Continue to believe in mistaken preconceived ideas about ozone, or join the thousands of practitioners who are improving and saving lives on a daily basis with this wonderful, nurturing, oxygenating / oxidizing, rejeuvenating gas: Ozone. Thank you for reviewing the contents of this web site. Do you have something to contribute? If so email us at info@oxygenhealingtherapies.com and your information may appear on this web site! Information posted on this website has not been reviewed or approved by the FDA. Oxygen Healing Therapies.com makes no claims regarding the equipment, instruments, books, or courses advertisers on this website may advertise. Unless otherwise stated, the instruments (equipment) advertised on this site are NOT approved medical products. The Supreme Court has also confirmed that websites posting advertising or links to other websites are not responsible for the information posted on the other websites. This area and these pages are for information only, and should not be considered as medical advice. We are an information source only, and are making no health claims regarding any medical benefit or outcome to any disease state. Ozone Therapy, EWOT Therapy, and UV Therapy are not formally approved medical therapies in USA, Canada, nor in many countries around the world (which is rather unfortunate because they are approved in many other countries such as Germany and Italy..but we digress). This information is supplied so that you can make an informed decision regarding altervatives. Please consult with your health practitioner before considering any therapy or therapy protocols.